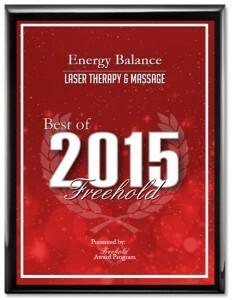 Pain Management and Massage in Freehold, NJ	Pain Relief, Cupping Massage, Lymphatic Drainage, Stress Release and Relaxation. Call 732-462-0909 Free Consultation. Come to experience Laser Therapy for Pain Relief, Cupping and Therapeutic Massage, Laser Facial Rejuvenation and Skin Care treatments, for your healing, beauty and relaxation, in a caring and nourishing atmosphere. 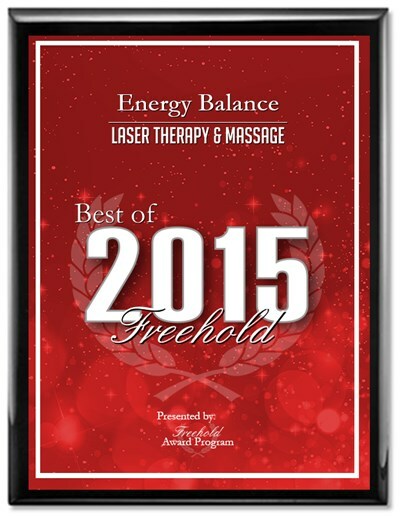 Our Laser Therapy and Massage Center in New Jersey received Best of Freehold Hall of Fame Award for winning this esteemed professional award for the sixth time, from 2009 to 2015. We are one of the first to offer the most advanced therapies and latest technology, supported by scientific research done by NASA, US and British Military, and Harvard Medical School: Cold Laser Healing Therapy, Red Light Therapy, Cosmetic Laser Acutherapy, and Collagen & Elastin Infusion based on the Regenerative Medicine Study for wounded soldiers. 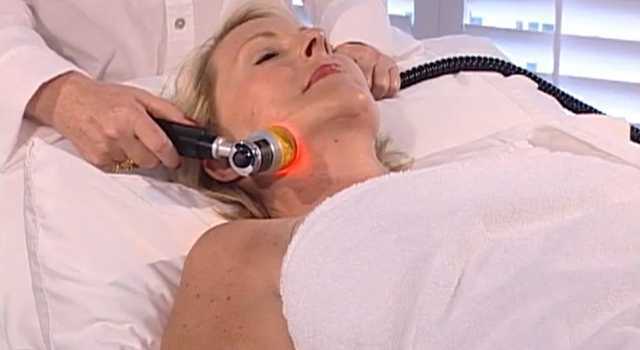 We use FDA approved laser in providing therapy for acute and chronic pain, sports injuries, post-surgery and acne scars. Laser acutherapy is used successfully for Smoking Cessation and Stress Management. We offer Elastin & Collagen Infusion therapy and Laser Anti-aging Facial Rejuvenation, Body sculpting and Cellulite treatment. More information about medical applications and clinical studies is included on the Laser Therapy Information page. We are proud to announce that our THOR laser was used at the Olympics by teams from the USA, Great Britain and Australia. Cold Laser therapy provides improved physical condition for athletes, prevents and treats pain and injuries quickly and effectively. It can be complemented by Cupping Massage (without bruising) for additional benefits, exemplified by Michael Phelps' increased performance after therapy. Treatments with Thor laser were discussed more recently at the United Nations Global Health Impact Forum, as contributing to advancement in improving global health. We provide pain management with laser treatments and therapeutic massage, neuromuscular and mayofascial release, pain neutralization technique (PNT), hot stones and deep tissue massage, CranioSacral therapy. We have specialized services for pregnancy, fibromyalgia, cancer, mastectomy, and post-surgery, offering prenatal massage, lymph drainage, scar tissue elimination, oncology and mastectomy massage, reflexology, reiki, emotional release and detoxification. Please check our Services page for details. Our holistic approach to wellness is customized to each individual's needs to nurture your body, mind and spirit. We assist you on the path towards healing, with professionalism, skill and compassion. As part of our work for the community of Freehold, we offer free presentations regarding a holistic approach to healing and wellness. For special discount offers, health information, and our free Health & Wellness Newsletter, please complete the sign-up form. To make an appointment, please submit your request. We shall call you back to confirm your appointment, and also answer any questions you may have. Please contact us by phone at (732) 462-0909 or Email [email protected]. We have Gift Certificates for all your special occasions, anniversaries and holidays, starting as low as $25. You can choose the best prices for Special Discounts monthly, or for specific holidays, so check for updates. Also check our Price List for additional information.